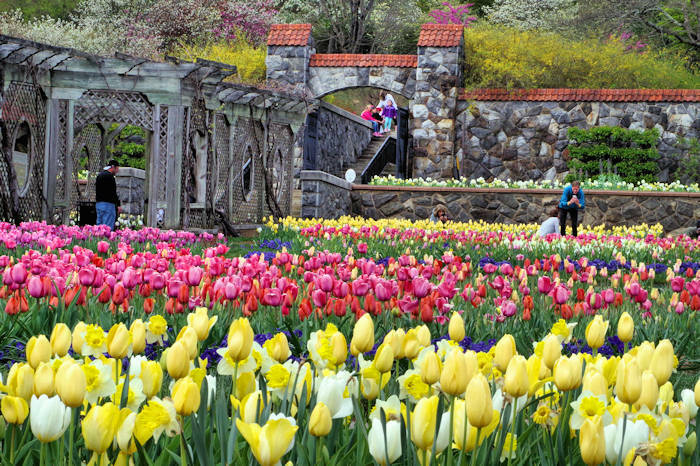 Celebrate Spring with a spectacular display of colorful blooms across Biltmore Estate. 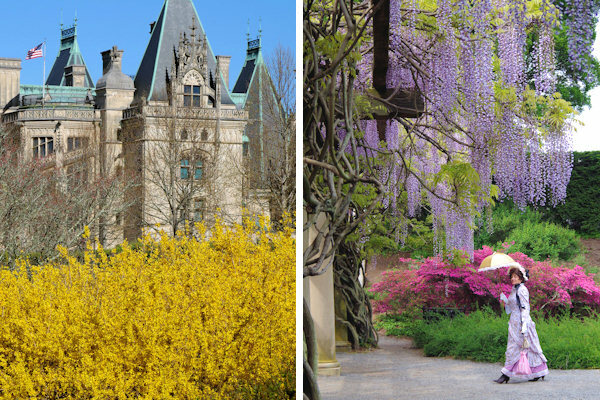 Starting on the first day of spring, Biltmore celebrates the legacy of Frederick Law Olmsted and his final project – George Vanderbilt’s magnificent Biltmore gardens. The bright colors in the gardens are brought inside with an opulent display of tropical plants and lavish flowers inside Biltmore House. During this festival of flowers, see spring evolve with a steady progression of blooms with 100,000 bulbs planted on the estate. Tulips abound at Biltmore’s main entrance and the big display in the Walled Garden with 50,000 tulips, 14,000 daffodils and 1,000 hyacinths. An extra bonus during your 2019 visit will be the special exhibition inside Biltmore House, A Vanderbilt House Party Costumes (Feb 8-May 27). Check back for special offers and discount tickets. 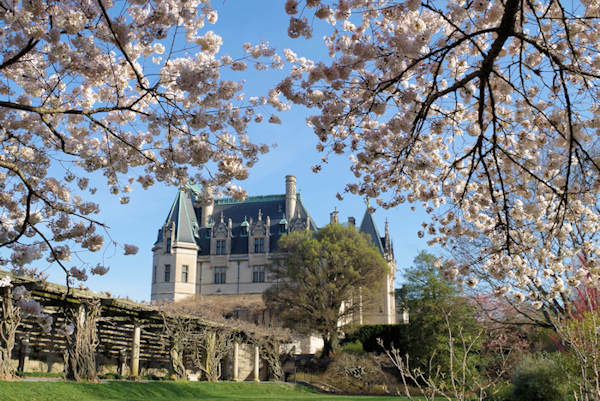 In addition to Biltmore House and gardens, estate admission includes entry to the Winery, Antler Hill Village, Farm and Barnyard, gift shops and restaurants. Save $100 on annual pass during April 2019, $119/person. Buy online. 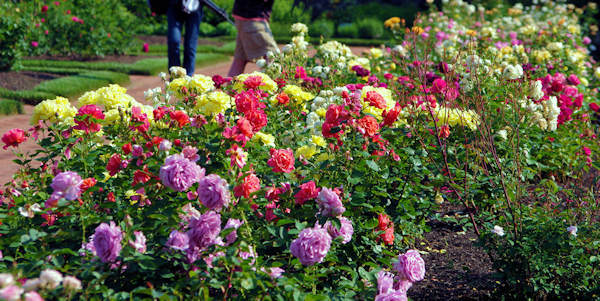 Buy tickets on Biltmore Estate web site 7 days in advance and save up to $10. Adult tickets are $65-$85/person. No promo code needed. Get a free audio tour for “A Vanderbilt House Party” for your house tour on February 8-May 27 when you purchase your ticket on Biltmore Estate web site. On Mother’s Day weekend (Saturday & Sunday), all mothers receive $25 admission with the purchase of adult or youth ticket. For more information & to purchase tickets online, go to the Biltmore Estate Web site. Late March: More than 200 orchids start the celebration inside the warm Conservatory. 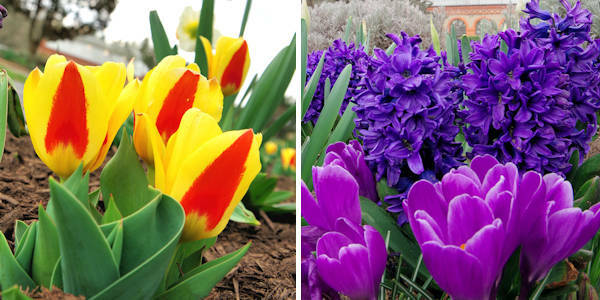 Hyacinth, crocus and other early bulbs blossom in the Walled Garden, along with the kobus magnolias. Early April: Towering forsythia blooms in the Spring Garden and 15,000 daffodils steal the show in the Walled Garden. Early tulip varieties join in. Stroll the gardens to discover a big variety of flowering shrubs and trees including spirea and flowering cherries. Mid April: It's peak tulip time! Dogwoods and redbuds provide a beautiful backdrop. 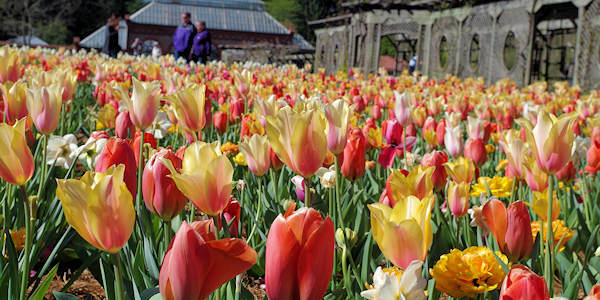 Most of the 74,000 tulips on the estate are in the Walled Garden. Late April: Late tulips open in the Walled Garden along with early blooms in the azalea garden and many flowering shrubs. Walk under the wisteria pergola. 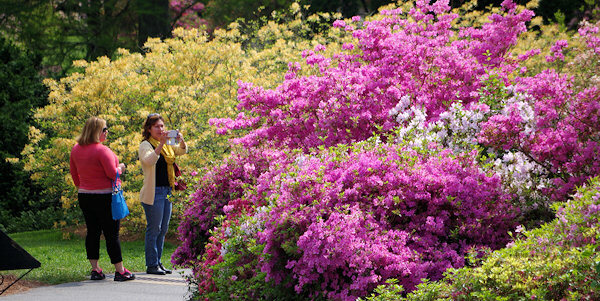 Early May: It's peak time in the massive 20-acre azalea garden of a million blossoms, ablaze in shades of pink, purple, orange, red and white. Take a hike on the walking trails to discover blooms throughout the estate. Late May: The rose garden smells as wonderful as it looks. 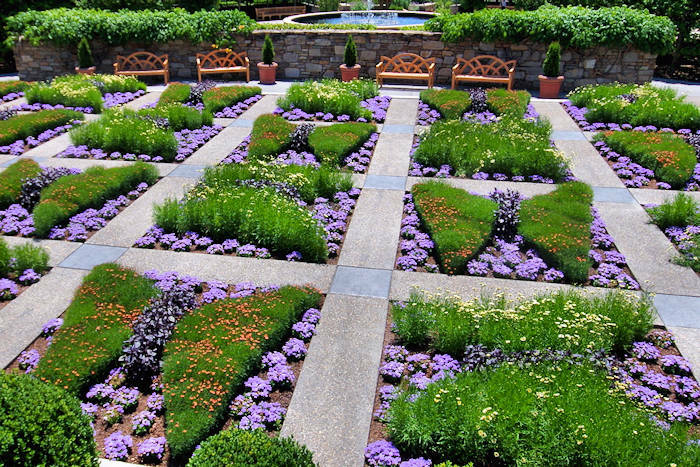 Summer perennials and annuals take over the Walled Garden. 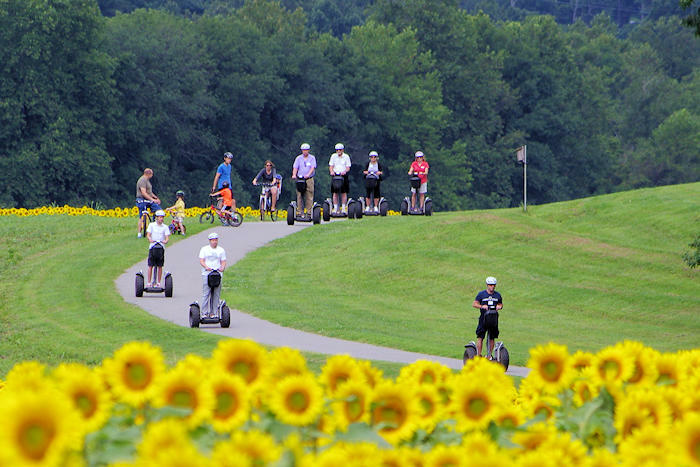 Located about 5 miles past the Biltmore House, find much to do after your house tour or the following day. Enjoy weekend live music in the Bandstand near Cedric's Pub, shopping and the Winery. Visit with the friendly resident animals at the farm and their spring newborns such as baby goats, lambs, chicks and bunnies. 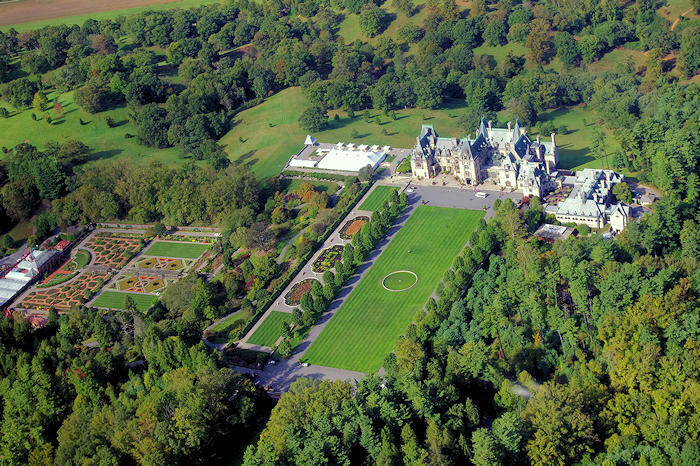 See the special exhibition at Biltmore Legacy. Read more about Antler Hill Village. Don't miss the Winery! Learn about Biltmore's wine making and taste many award-winning wines in the gorgeous Tasting Room. 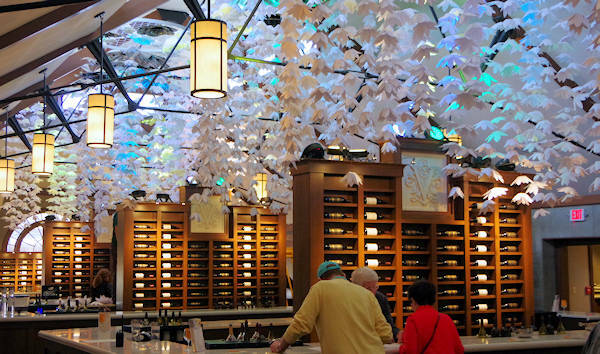 Take a behind the scenes tour or unwind at the Wine Bar. Read all about the Winery. See our Biltmore Insiders Guide for a compete overview of the estate with many tips for the perfect visit. April 21, 2019: The Easter Rabbit makes his annual appearance on Biltmore’s Front Lawn on Easter Sunday, along with special children’s entertainment including magic shows, music, storytelling, crafts and photos with the Easter Rabbit. Highlighting the day are the grand Easter Egg Hunts at 11 AM and 1 PM. Children ages 9 years old and younger may attend the hunt for free when accompanied by an estate passholder or a ticketed adult. Day-of registration will be required. A special Easter Sunday and Mother's Day brunch is served at three estate restaurants: The Dining Room at The Inn on Biltmore Estate, Deerpark and Bistro. Make reservations well in advance! Go to their Web site for restaurant details. 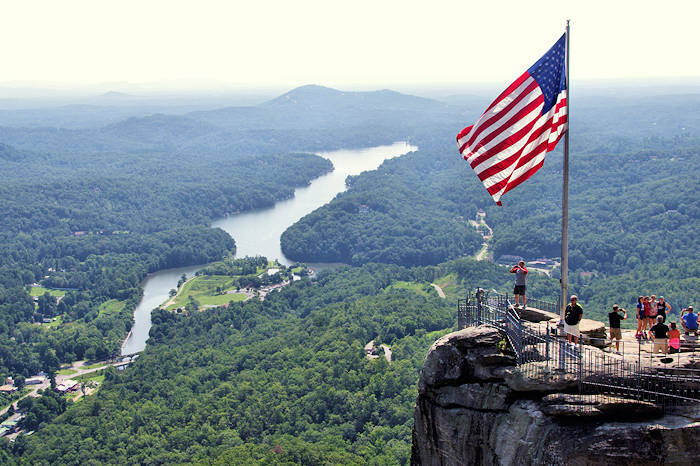 Take in the grandeur of our country's largest home, the "Downton Abbey" of America. Explore the many rooms inside the house, walk through breathtaking landscapes and gardens, taste vintages at the winery and enjoy fine dining. See many things to do with our detailed insider's guide! See the fabulous clothing exhibition inside Biltmore House, “A Vanderbilt House Party: A Gilded Age” and imagine yourself as a cherished guest at one of George and Edith Vanderbilt's grand turn-of-the-century celebrations. Included in admission.